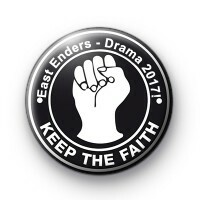 Custom East Enders & Drama badge 2017 for Heather Baker in the Northern Soul style black & white design. Customised 25mm button badge. If you would like a custom badge, you can upload your own or get in touch with your requirements using our contact us page.